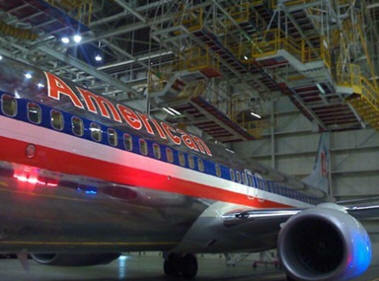 September 16, 2012 - In another step to undermine U.S. workers American Airlines will outsource its aircraft maintenance to China. Larry Pike president of the Fort Worth's local Transport Workers Union said, "This is the result of corporate greed." Pike reported the work performed on America’s Boeing 777 aircraft which was done by Alliance will now be shipped to a company in Hong Kong called Haeco. More than 1,000 American workers will lose their jobs at Alliance. The common trend by the airlines has been to outsource thousands of high skilled jobs to aircraft maintenance repair companies overseas that are not tightly regulated or inspected by the Federal Aviation Administration (FAA) as those maintenance divisions are typically run by the air carriers themselves. In 2007, the FAA's Inspector General reported of nine major air carriers reviewed 71 percent of their heavy airframe maintenance checks were sent to overseas repair stations. In 2009 the numbers are even higher. Southwest Airlines now flies its 737’s to El Salvador for major overhauls. In 1999 American, United, Northwest, US Airways, Delta, TWA, and Continental all performed the majority of their aircraft maintenance work in-house. Regional airlines also kept a large portion of their work internal and within the United States. However, just after 9/11, the in-house standard changed, the percentage of work outsourced in terms of maintenance dollars had risen from an average of 26% in 1999 to over 40% in 2009, a figure which remained under 50% primarily because American Airlines was performing most of its work in-house, now that will skyrocket. Foreign maintenance allows companies to forgo employee background checks, no drug testing, aircraft mechanics do not have to be licensed only supervisors are required to be licensed mechanics, and FAA inspectors are forbidden from making spot checks and surprise inspections a common occurrence at U.S. overhaul bases. In fact, at major U.S. maintenance facilities FAA inspectors are present on a daily basis. A 2008 report by the Inspector General at the Department of Transportation found that FAA and industry inspectors are not monitoring airplane maintenance work properly. The Inspector General's investigations found that FAA inspectors never even showed up at some foreign repair stations for as long as three to five years. Most disturbing, many of the workers repairing U.S. aircraft overseas are incapable of reading repair manuals printed in English. Workers in these offshore repair centers are generally under severe time pressure and often fail to find co-workers who can read the instructions.